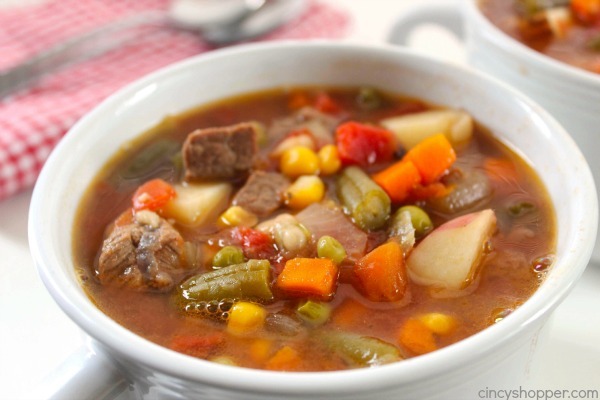 You will find this Slow Cooker Vegetable Beef Soup loaded with lots of vegetables, beef, and tons of flavor! You can toss all your ingredients in the Crock-Pot and have dinner ready when you are. Perfect fall and winter comfort food. We are a soup sort of family. All year long, we like to enjoy soup for dinner. In the summer, we will enjoy soup paired with a salad and during the fall and winter months, we like to enjoy our soup with bread. Soup is great year round but when fall and winter arrive, I like to bust out my crock-pot and whip up a big batch of soup that I know we can eat for a couple of days. Slow cooked soup seems to get better the longer it cooks. Vegetable beef soup is one of my families favorite soups. 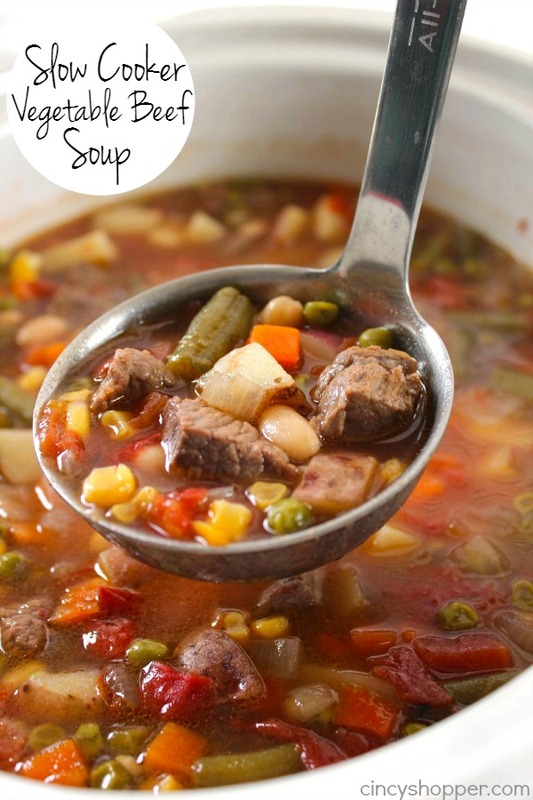 They love when I make a big batch of Slow Cooker Vegetable Beef Stew or when I make this super delish Vegetable Beef Soup. Perfect for warming up on a cold day. My kiddos can be picky about eating their vegetables. When I load them in a soup, casserole, or stew, they do not complain much. I will find a few peas in the bottom of one of their bowls, green beans in another, ha ha. But in general they will actually eat the veggies when they are immersed in a sauce or broth. 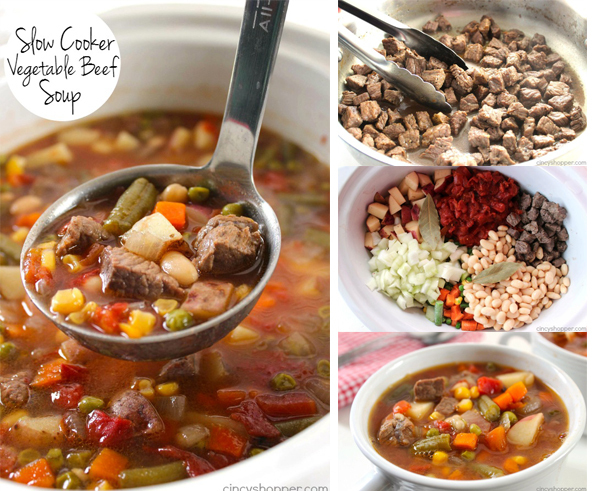 Making soups in the slow cooker is so easy. I usually brown off my meat a bit before adding it to the Crock-Pot. but, you can actually skip that step if you are pressed for time. 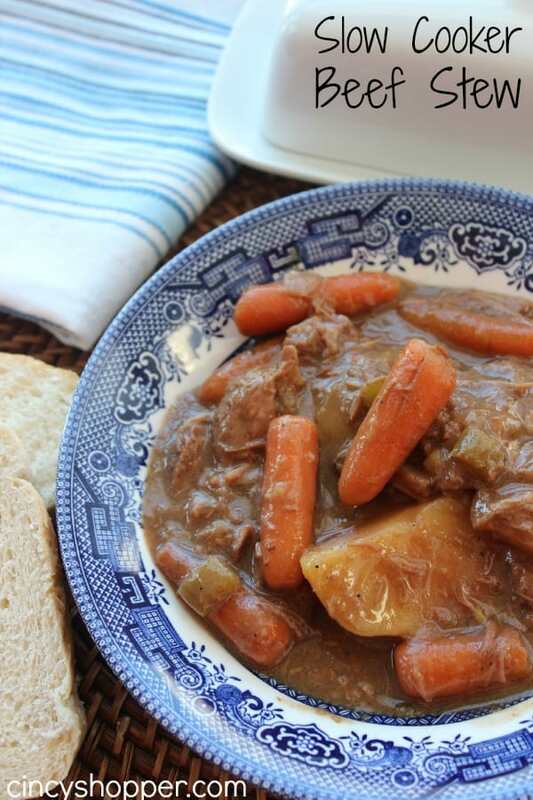 Dropping everything in the slow cooker and then letting it cook all day makes for the most tender meat and veggies. 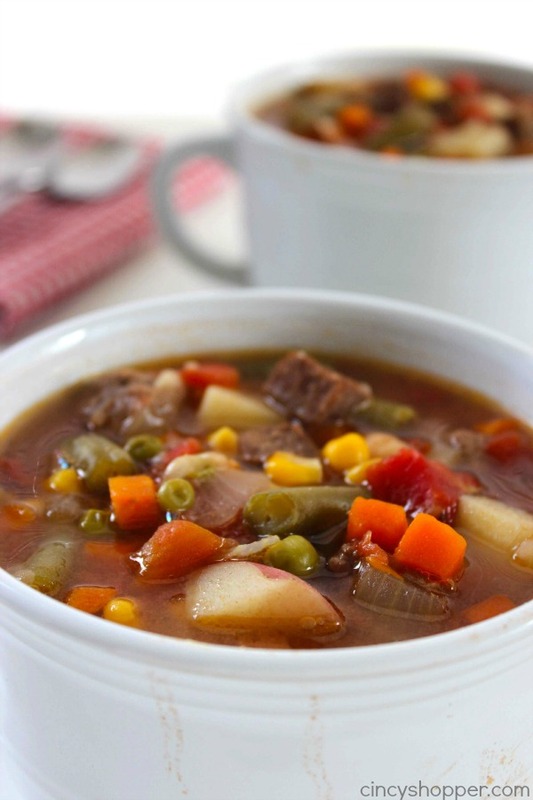 If you are a fan of Vegetable Beef Soup, this recipe will become one of your favorites. 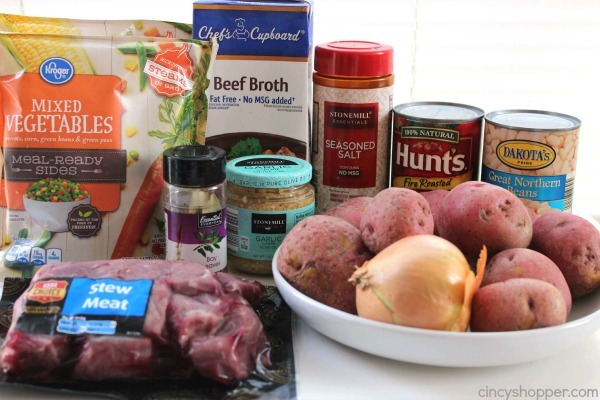 With just a package of beef, veggies, broth, and a few seasonings you can have this one cooking in know time at all. Season cubed beef with seasoned salt and pepper. 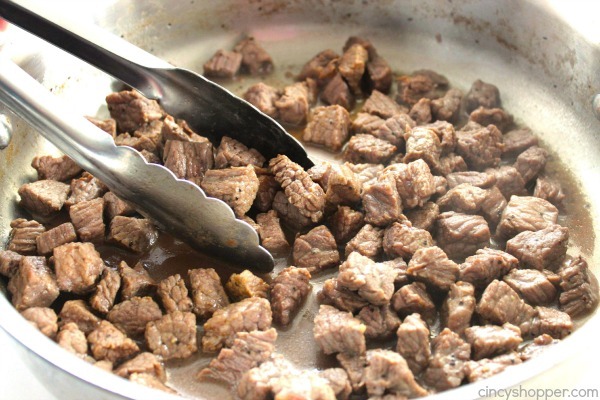 Brown beef in skillet on all sides. Test doneness by checking potato to see if it is soft and beef to make sure it is not tough. I made this vegetable soup for dinner and then we also enjoyed it for our lunches for the past two days. The longer it cooks, the more flavor it has. Love it! 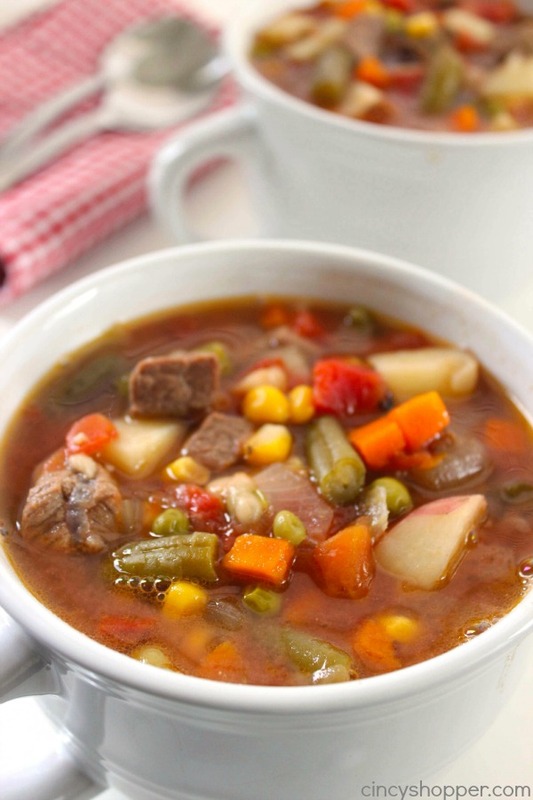 Do you have a favorite slow cooker soup you enjoy during the fall and winter months? Simple and delicious comfort food. Love it! I would love it if you would share this great post today at our WIW Linky Party. I hope you can join us! 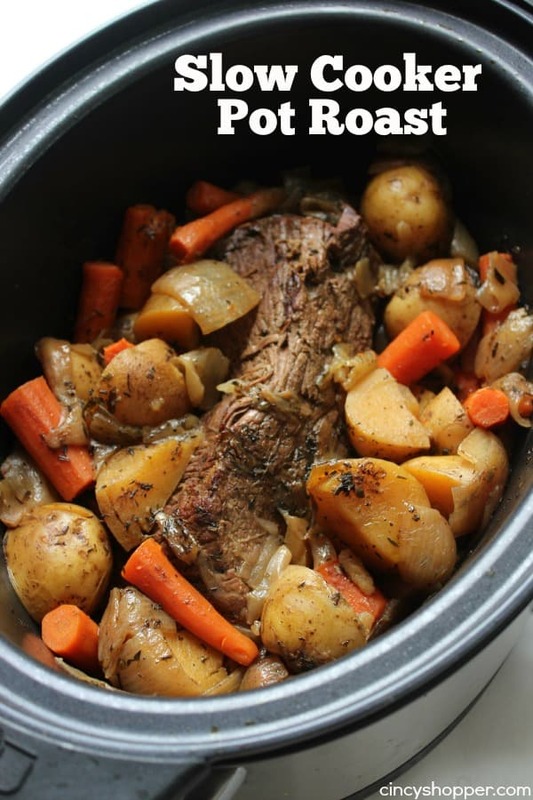 Love love love slow cooker recipes. 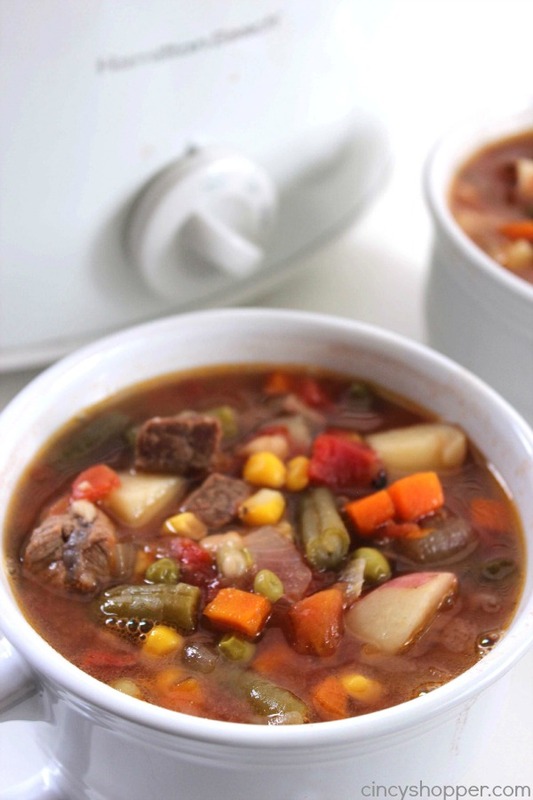 This hearty soup looks perfect for this fall and winter. Such a great classic! I pinned it to my slow cooker board. I cannot wait until it is cool enough to think about soup. I’d settle for somewhere in the 80s. Thanks for sharing on the #HomeMattersParty this week. I hope you join us next week. I always love your recipes and this is perfect for our family. We all love veggies and soup is our staple in the fall and winter! And knowing that I can throw this in the crockpot, BONUS!!! How big is your slow cooker? I just made this and I had to omit the beans because mine would have overflowed, bummer! Hopefully it will be just as yummy without them, sure smells good! Hi. This looks delicious! Thanks for doing what you do! I have a question. Do you leave this in the crock pot until it’s gone (and if so, on what setting/temp) or do you put it in the refrigerator at night? I never know what to do with crockpot meals over night. Definitely put it in the fridge overnight. If you want you can put crock and all in the fridge, just make sure your crock has cooled off. Then when you want to heat it up, if you want to use your crock pot again, make sure your crock warms up to room temp before turning on so you don’t crack it. This was delicious. My husband loved it and even my 4 year old ate a whole bowl! Fantastic recipe! All my kids have been coming down with a cold. This soup is just what the doctor ordered. It was a snap to put together and turned out beautifully. 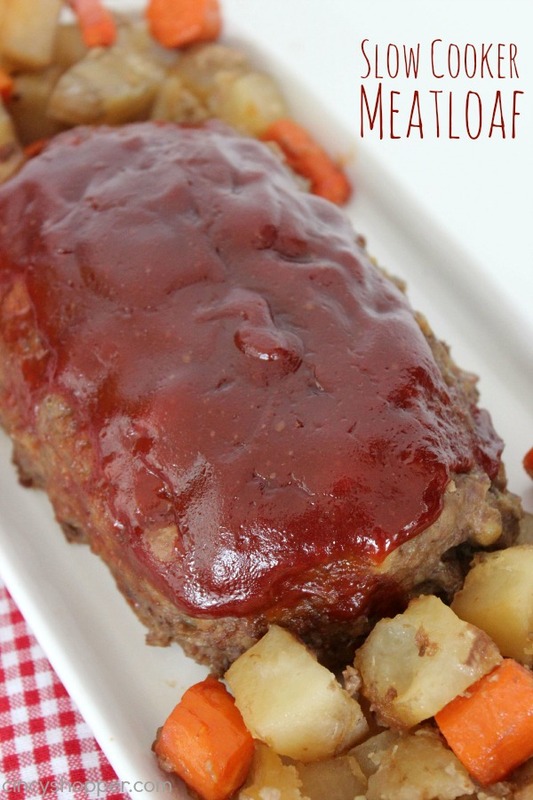 Very flavorful and hearty and the meat was melt-in-your-mouth tender. This one’s going to be a regular in my recipe arsenal. Looking forward to trying some of your other recipes! Looks yummy! Pinned! Thank you for sharing on Merry Monday! Hope to see ya next week! For this recipe, how many servings do you get? Everyone I shared this soup with LOVED it. I need to make it again soon. This is definitely a keeper. I didn’t have a can of white beans so i used a can of butter beans. I think I would have like the white beans better but I don’t think it really made a difference to the overall take. I believe this would freeze really well. Can I omit the tomatoes and will it still taste good? Have made this 3 times. I use only 1 cup potatoes and add some red kidney beans for color. My husband s on a low sodium diet so I use all low sodium canned goods and broth. Still tastes great!!! 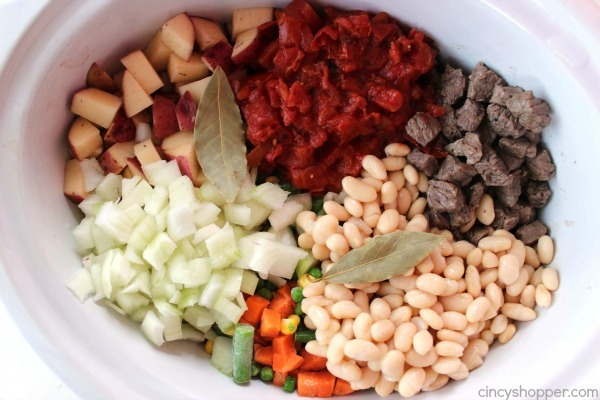 Getting ready to make this soup for the weekend football games! I would like to include barley. Has anyone done the same and if so did you substitute the barley for maybe potatoes? 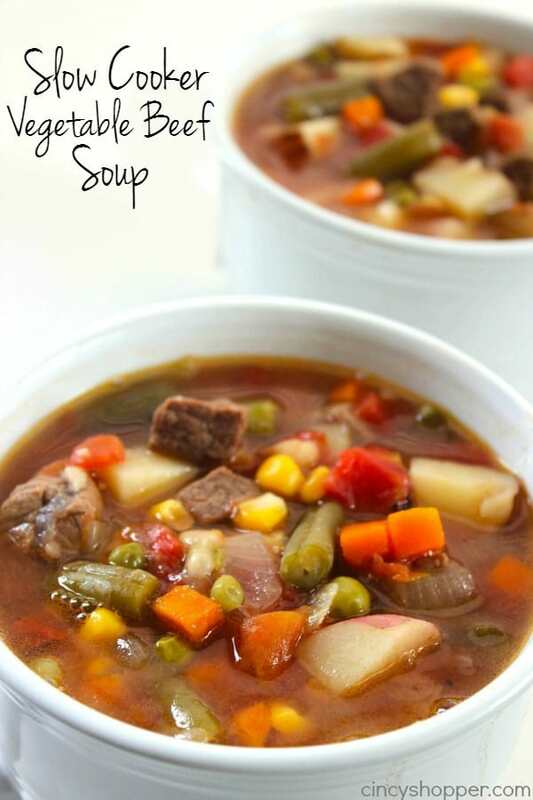 My husband loves vegetable beef soup. I can’t wait to try this out! Shared this recipe on the Slow Cooker Recipes & Tips FB Group. It is a delicious recipe I have used repeatedly. Hoping to get you even more followers. Hi Denise! I am glad you enjoy. Thanks so much for sharing it with others. I really appreciate the shares.